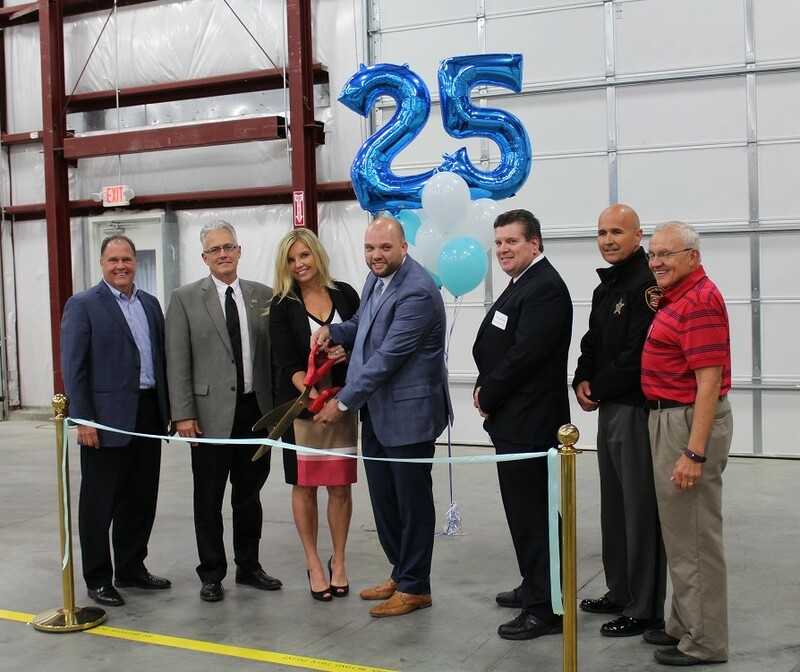 Slice of Stainless celebrated the completion of their major building expansion and marked the 25th anniversary of their founding in a ceremony held May 12, 2017. Local officials, customers and suppliers were on hand for the celebration. The recently completed expansion nearly doubled the size of the Cincinnati facility to 55,000 square feet. The expansion has allowed Slice of Stainless to increase warehouse capacity, add shearing equipment and improve material handling systems. The celebration also marked the company’s 25th anniversary of their founding in 1992. Robin Tackett and her late partner Todd Reed started the business from their home, supplying small quantities of specialty stainless steel sheet. Today the business has grown to a 15-person company with over $1.5 million in inventory. The expansion includes a redesigned freight entrance with more loading docks. The company has added more shears and another crane to move material. Slice of Stainless carries 19 grades of stainless and nickel sheets from 0.012-inch to 0.25-inch thick. They still offer material cut to size, but also supply other distributors with full sheets. Clermont County Chamber of Commerce President Matt Van Sant; Clermont County Commissioner David Painter; Slice of Stainless President, Robin Tackett; Slice of Stainless Vice President, Brandon Tackett; Union Township Trustee John McGraw; Clermont County Sherriff Steve Leahy; and Dr. Greg Sojka, University of Cincinnati Clermont College. Congratulations! We appreciate the opportunity to partner with the fine folks at Slice of Stainless! Dean, thanks so much! We love working with you. Congratulations!!. But how come no picture of Tom Sexton? Well, we have a group photo on our About Page, scroll to the bottom. Too many Tom Sexton photos on our website might break it! Congrats on the expansion completion!! We’re definitely quoting you! Thanks Pete!